2 + = three Required Please enter the correct value. The landmark Supreme Court ruling to uphold the Patient Protection and Affordable Care Act (PPACA) – informally known as Obamacare – has fundamentally changed the relationship between U.S. consumers and the healthcare market forever. The decision will have sweeping political and economic ramifications. And moderate estimates say it will cost $900 billion to implement. Editor's note: New research shows that the federal government's current economic policies and programs could be exponentially more dangerous than first suspected. And time could be running out for Americans to prepare their wealth, investments and day-to-day life. Find out more here. But while almost everyone is hung up on the law itself and its economic sustainability, smart market-watchers are already moving to invest in the individual sectors poised to profit. Amazon.com Inc. (Nasdaq: AMZN) stock is up more than 15% in midday trading, after an earnings report that predicted slowing growth and profits in Q3. So why are investors interested in a stock that will make less money – and may even post a loss? Money Morning's Chief Investment Strategist Keith Fitz-Gerald joined Fox Business' "Varney & Co." Friday to talk about the value in Amazon.com. Keith explained how Amazon.com's Q3 outlook isn't a bad thing. Keith also shared a stock that he sees outperforming in this economy, and talked about how the GDP numbers highlight the "mess" Washington has created for the U.S. economy. Watch this accompanying video for Keith's full analysis. Investing in silver and gold has become more attractive since the U.S. dollar just doesn't have the clout it once did. Fears over where the dollar is headed – especially with continued money printing from the central bank – has pushed safety-seekers into investing in silver and gold. Demand has also pushed gold and silver prices to new highs. The idea of using gold and silver as an alternative currency has spread as the metals have grown more valuable. In fact, worries that the U.S. dollar is on the cusp of a collapse have lawmakers from more than a dozen states (up from just three in the past few years) seeking approval from their state governments to either issue their own alternative currency or use gold and silver as a currency for settlement of state-related transactions. Rep. Glen Bradley, R-NC, who introduced a currency bill in 2011, told CNN Money, "In the event of hyperinflation, depression, or other economic calamity related to the breakdown of the Federal Reserve System… the State's governmental finances and private economy will be thrown into chaos." During the great Dotcom days, analysts were fond of saying that "growth is the new income." Back then, tech stocks were all the rage. Some even went as far to say that if a tech stock didn't have a triple digit price/earnings ratio, it wasn't worth buying. There were even 70 year-olds at the time who bragged about the optical networking stocks they owned – but couldn't program the clock on their VCRs. That didn't end so well….did it? But it's been a long time since the Dotcom crash. Twelve years later, tech stocks are stronger than ever. The trick is to find good companies with good ideas that can translate their core competencies into niches that complement each other. That way, when one niche falters, the others pick up the slack. Alternatively, winning tech stocks need to dominate their sector with quality goods, innovative leadership and a dynamic corporate structure. They also have to have proprietary technologies that can keep pace with a rapidly changing marketplace. If you rest on your laurels these days, it can mean ruination, no matter what size company you are or how much market share you own. If you doubt that, consider this…. Many experts claim we're not in a bubble economy because they can't see the "bubble." The bubble is so enormous right now that any serious bailout attempt would have to encompass the entire shootin' match or roughly $600 trillion to $1.5 quadrillion ($1,500,000,000,000,000) in order for it to work. That's the total estimated amount of outstanding derivatives, credit default swaps and exotics outstanding at the moment according to various industry sources. I say estimated because nobody actually knows for sure. Nearly five years into this crisis, the derivatives markets still remain almost entirely unregulated. And, that's why the well-intentioned but completely misguided onesey-twosey's bailouts we've seen so far won't cut it despite the fact that they're already into the trillions of dollars. I say this because, despite what most politicians and central bankers think, we are not staring at a series of independent bubbles blown into the wind, but a single, massive all-encompassing monster bubble that surrounds us all. To put this into perspective, the total value of the United States' economy is approximately $15 trillion. 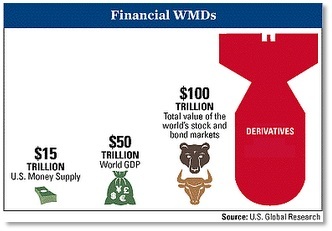 The world's GDP is around $50 trillion while the total capitalization of world stock markets is only $100 trillion. You can see the problem as easily as I can…there literally isn't enough money on the planet to bail us out, and I don't care who's got the keys to the printing presses. Bubbles this big don't form overnight. What we've been handed is an overlapping bubble that's gotten progressively larger over time as our legislators, bankers and regulators have progressively "improved" the system over time. The first Facebook earnings report since the company went public was released today (Thursday), and the numbers came in right in line with lowered, underwhelming expectations. Facebook met earnings per share estimates of 12 cents on revenue of $1.18 billion. Analysts had expected EPS of 12 cents on revenue of $1.16 billion. Estimates had been slashed several times and many experts did not think Facebook (Nasdaq: FB) would miss these lowered estimates – especially after is horrible IPO already delivered a colossal disappointment. But the fact that earnings forecasts were so low made the fact that the company beat them a non-event. "These earnings are meh," one equities analyst told Business Insider. Another problem with the earnings report: There were no real clues as to how Facebook was ever going to make real money. Facebook has had a hard time turning users into profits as more people use Facebook via mobile, an area Facebook has yet to monetize – and a key issue investors want addressed in today's earnings call. "Everything is moving toward mobile," Debra Williamson, an analyst at eMarketer, told USA Today. "Gaining revenue from mobile and improving that experience are two things that Facebook absolutely has to focus on in coming years." Reports surfaced Thursday that Facebook hired a team of former Apple Inc. (Nasdaq: AAPL) employees to completely redesign the Facebook iPhone app, which will no doubt include some of its new advertising plans. The aim is to generate more revenue from its growing mobile user base. But it's still unclear whether or not Facebook can do that. Amazon.com Inc. (Nasdaq: AMZN) today (Thursday) reported a fiscal second-quarter profit of $7 million, or a penny a share, on revenue of $12.83 billion – very close to what was expected, but still a miss. Analysts forecast a sharp increase in revenue, estimating earnings per share of two cents on revenue of $12.92 billion. Sales were up 29%., but net income fell 96% from the same period a year ago. Weighing on its bottom line was investments in new distribution facilities, a number closely watched because Amazon has a history of reporting strong revenue. The company has been plowing copious amounts of its earnings into building a distribution network to help it more efficiently grow its business long term. After reporting better-than-expected first-quarter numbers, 41 cents on revenue of $9.91 billion, the Seattle, WA.-based company had expected revenue to fall in the range of $11.9 billion and $13.3 billion. Pushing the stock down as much as 7% in after-hours trading was the Q3 guidance. Amazon.com predicted a Q3 operating loss of between $50 million and $350 million, versus Wall Street estimates of income of $119.6 million. Amazon said it expects Q3 revenue of $12.9 to $14.3 billion, which includes the Wall Street estimate of $14.1 billion. There's not much to love about an ultra-hot U.S. summer – unless you're investing in natural gas companies. The record-breaking temps (the U.S. is on pace for its hottest year ever) have made the country crank the AC, lifting natural gas prices and stocks. In testimony yesterday (Wednesday) before the House Financial Services Committee, U.S. Secretary of the Treasury Timothy Geithner may have inched us closer to QE3 when he warned that the U.S. economy will be slammed by two major factors: the immediate danger from the Eurozone debt crisis and fiscal cliff 2013 that is fast approaching. "The economic recession in Europe is hurting economic growth around the world, and the ongoing financial stress is causing a general tightening of financial conditions, exacerbating the global slowdown," Geithner said in his testimony. As much of the revenue for major U.S. corporations such as Ford Motor Co. (NYSE: F), DuPont (NYSE: DD) and Cisco Systems Inc. (Nasdaq: CSCO) comes from Europe, the damage is already being felt by both employees and shareholders. Cisco, down 20.52% for the quarter, recently announced the layoffs of 1,300 workers, about 2% of its global labor force. Geithner cited other factors harming the U.S. economy, including the rise in oil prices earlier this year, cuts to government spending and slow rates of income growth. Possible adverse developments in the future, particularly the fiscal cliff, led Geithner to warn that, "These potential threats underscore the need for continued progress in repairing the remaining damage from the financial crisis and enacting reforms to make the system stronger for the long run." Investors use earnings season as a key tool for decision making – but you might not be able to believe everything you hear. On Wednesday afternoon Money Morning's Chief Investment Strategist Keith Fitz-Gerald appeared on Fox Business with Melissa Francis to discuss a recent survey with a shocking statistic. Turns out about 20% of companies misrepresent or lie about their earnings – a hefty number when you consider you could be invested in one of these companies. "This is one of the greatest games going," said Fitz-Gerald. CFOs who were surveyed admitted to "managing" earnings reports – and their reasons highlight how investors are not their top priority. Fitz-Gerald calls the whole scheme "financial hocus pocus" – but don't worry, there are ways to protect your portfolio from these misleading companies. "Investors should not be scared of stocks, but this should serve as a colossal slap in the face that they need to get serious about how and what they buy," warned Fitz-Gerald. Watch the accompanying video to see Fitz-Gerald's analysis on how you can decipher earnings reports to avoid getting fooled.